Bangkok is a modern city thriving with culture, art, music, food and anything else you could ask for. When we landed in Thailand's capital we didn't even know where we were going to stay. The trip happened so spontaneously we hadn't figured out any details. Luckily our good friends and fellow bloggers HandZaround were already there, and they booked us a room in a great little hotel where they were already staying called Eco House. Small but clean and private rooms with shower go for 500 baht or $15 in a great central location. The Tipsy Gypsies Tip: If you're traveling through SE Asia, Agoda.com is your best source for online bookings. Better deals can always be arranged in person, but unlike India or Europe Agoda beats Booking.com on prices almost every time. The Tipsy Gypsies Tip: Public transport is an easy and convenient option but it doesn't always work out to be the cheapest here depending on where you are going and how many you are traveling with. 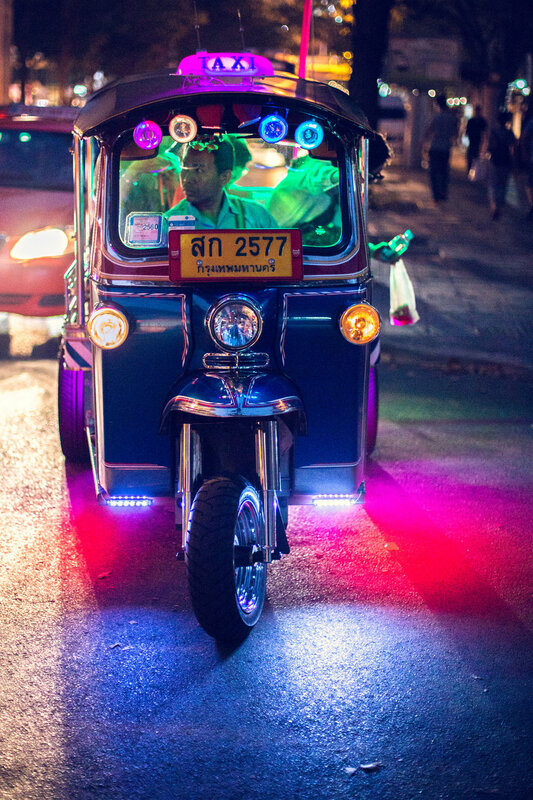 Auto Tuk Tuks are a must try experience in Bangkok with their neon lights and lavish decorations but also know that Uber is available. Sometimes you don't want to haggle or have to explain your final destination so having this option is nice. And unlike many other countries, we tested and found that normal taxis were typically the same price as an Uber so don't be afraid to flag one down either. Our arrival in Bangkok was unlike many others foreigners experience, as we had just come from nearly 6 months in India. 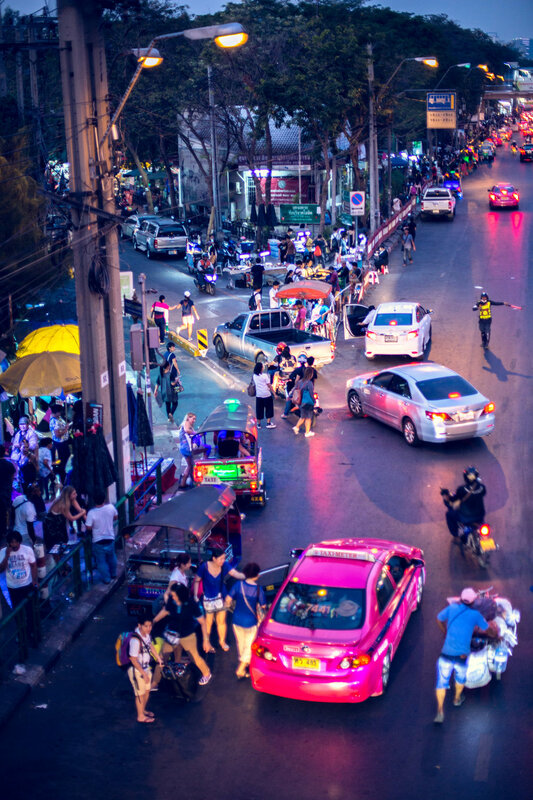 Most people who arrive in Thailand from the west feel overwhelmed with exotic and foreign excitement. We felt like we had just returned to the U.S... and that was a good thing! As our other blogging friends YesKamp once said, Thailand is "Asia Light". The city was so clean, organized and people actually followed the rules of the road! We saw our sheets were actually clean when we checked into our budget hotel. We couldn't believe it! All the stress, that had built up from the awesome insanity of our previous adventures in India melted away instantly. Having been on the road so long we skipped many of Bangkok's "must do's". Bangkok has more beautiful temples than you could ever want to visit. And having filled our thirst for temples months ago, we agreed to visit one but that was it. We visited Wat Pho with two amazing new friends Karol and Agnieszka from Poland we had met at our hotel. The temple is absolutely beautiful. The architecture and the giant statue of sleeping Buddha are breathtaking. It's a huge temple too so if temples get you hot and bothered, there is plenty to explore at Wat Pho. But again, we've already seen so many temples in India, we pretty much dine and dashed. What made us fall in love with Bangkok was the street food. From Chinatown to Chotochok weekend market (both must do's), to a hundred others we can't remember the name of or didn't have time to visit, there is an endless supply of new and exciting markets and dishes to try. 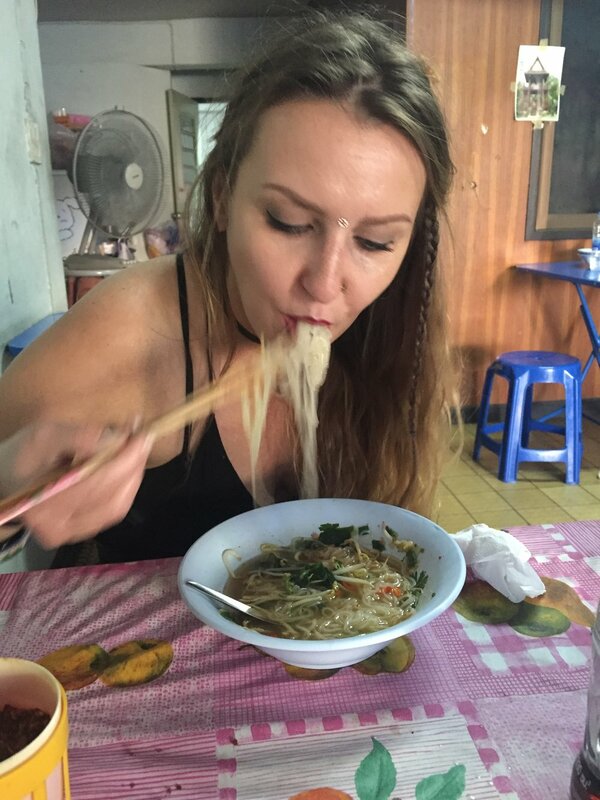 The Tipsy Gypsies Tip: Spend an evening in Chinatown stuffing your face with as many dishes and beers that you can manage, and then proceed to digest your horrendously gluttonous consumption with an hour long foot massage for 150 baht or about $4. The Tipsy Gypsies Tip: People touching your feet not your thing? Then after eating, settle down at Chinatown's Soulbar for a drink at let the sweet jazz melodies serenade you. Our next activity is not something you necessarily need to do in Bangkok, but we do feel it's a must at some point during your trip. The Thai cooking class in an awesome experience if you are a fan of Thai food. From going to the markets to learning about the ingredients, to making your own curry paste to finally cooking and eating your freshly made dishes will most definitely inspire your cooking creativity for when you get home. We went, per a friends recommendation, to Sompong Thai Cooking School and they were fantastic. The teachers were really friendly and spoke great English. For a budget traveller it was a little pricey at about $30 per person, but we found it worth the cost. Our last great adventure was again, thanks to our friends HandZaround. They had interviewed a local artist who was also in charge of what are known as Trasher parties. These are events thrown in large venues for Bangkok's LGBT community and they are awesome. Through a special invite we all attended one of their concerts and it was an amazing night. Gay, straight or anything in between, the people and community are amazing and we highly recommend you see if an event is happening when you are there as you'll have the best night partying possible. After recovering from our Trasher party hangover we said goodbye to our new friends and headed south for amazing island adventures you can read about here. Bangkok is most definitely a city worth exploring as it has a lot to offer before you head to the beautiful Thai countryside. We look forward to visiting this city again some day and can't wait to discover what else it has to offer.